This year my Mom, Dad, brother, sister, and their families are going to be together with us for Christmas. We are so excited! The last time we were together for Christmas was 9 years ago. Growing up, one of our family traditions was making sugar cookies together. In my excitement of everyone being together, I decided I would create an apron for each of the little cousins to wear. There are a total of 12 of them! 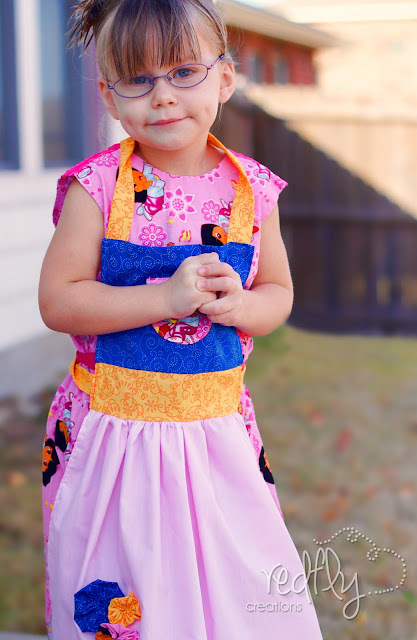 So, over the next couple of months you will be seeing several original little aprons tailored to the specific likes of each child. 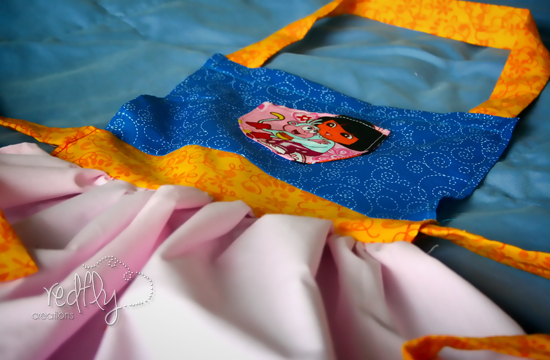 Today it is a Dora the Explorer apron which I made for my youngest niece. She is five and absolutely loves Dora. Yellow fabric: 18" x 2 1/2"
Pink fabric: 28 1/2 " x 17 1/2"
Dora fabric: cut out one pocket and one circle for flower (both from pattern). First let's take the 28 1/2" x 17 1/2 " piece of pink fabric. In order to get a curve on the bottom edge of the apron grab a bowl or something round to draw a curved edge. Cut around the curve. Then you are going to hem all around the skirt, except the top of the skirt. On the top of the skirt you are going to gather it. So lengthen your stitch, sew across it, and pull the gathering thread. Set this piece aside. Next, we are going to hem the two short sides of the yellow 8" x 3" piece of fabric. 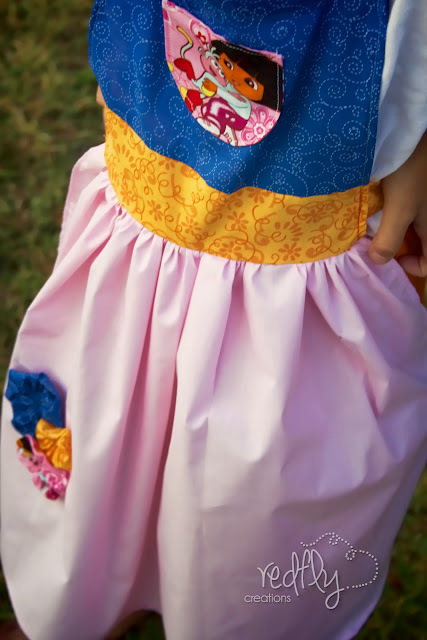 Now pin the yellow fabric to the top of the pink skirt. Bunch up the skirt enough so that it fits just exactly to the length of the yellow piece. Take one of the yellow 2 1/2" wide piece and sew it together the long ways to make one of the ties. Repeat for the other two 2 1/2" pieces. Remember right sides together, then turn them inside out and press. (I like to use a safety pin to turn long pieces like this inside out). Now we are going to hem the two shorter sides of the blue fabric 8" x 7" piece. 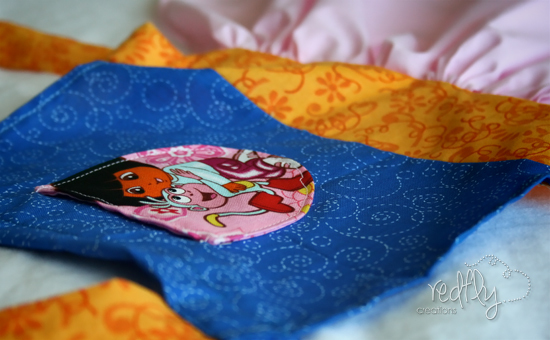 In all of my hems, I turn it under once, press, then turn it under one more time, then pin and sew. Ok, now let's sew the orange 8" x 3" piece to the bottom of the blue piece. 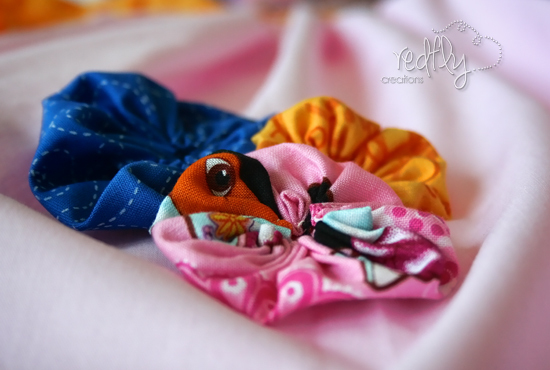 The other side of the orange piece should already be sewn to the top of the pink skirt (not shown in the picture). Now we have our skirt, middle band and blue piece sewn together. Before we move on, let's hem the top of the blue piece. This hem is going to be a little wider, about 1/2" for each fold. Now let's take the three straps and attach them to the apron. Center one on each side of the 8"x 3" yellow piece, and sew it on. Attach the last piece, which is 2 1/2 " x 18", to the top two corners of the blue piece for the neck strap. Yea! It's time for all of the fun embellishments. Using the pattern cut out two pockets from the Dora fabric. Sew the right sides together, all except for the very top. Turn inside out, press, then sew the top closed. Center it on the blue top, sewing it on on all sides, but leaving the top open. To make the rosettes, cut out the circle from the pattern. Fold just about 1/4" and stitch all the way around the circle. Pull it tight to create a rosette. Stitch the rosettes onto the bottom left corner of the skirt. Well, that is it, unless you have 11 more little aprons to make as I do. :0) Next on the list? My niece who loves princesses. Aah, how cute! You did a great job putting that together. :-) Thanks for sharing at The Fun In Functional! I am going to try to make these with Christmas fabric for my granddaughters. They are adorable. Thank you so much! !